May 2018 36 www.sportseventsmagazine.com Small Markets...Big On Sports! 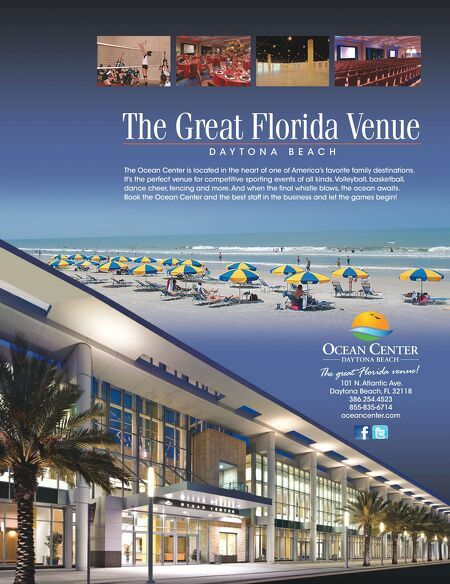 Sponsored Content ocated in the heart of Daytona Beach, Florida and only 400 feet from the Atlantic Ocean, the Day- tona Beach Ocean Center is the area's convention, entertainment and sports complex. It's a prime location to hold your next event. The Ocean Center is a world-class venue designed to meet the exacting needs of event planners. New features in the newly expanded center include over 200,000 square feet of multi-use space. The Ocean Center is situated adjacent to Ocean Walk Shoppes & Movies with shopping, restau- rants and entertainment and is surrounded by first-class accommodations. After your event, enjoy the sun-blessed beaches of Daytona Beach where activities are plentiful with parasailing, surfing, fishing, biking and much more. The Ocean Center is host to many sports and competitive arts activities, including gymnastics, cheer and dance competitions, basketball and volleyball tournaments, and much more. The flexible facility includes an exhibit hall, arena, ballroom and over 32 spacious meeting rooms. The arena covers 42,146 square feet and can seat 9,600. The exhibit hall is 93,028 square feet with six loading docks and is home to many sport- ing events. The ballroom is 14,000 square feet of space and can accommodate 900, banquet style. Meeting rooms cover 32,000 square feet and offer 32 breakout rooms, an executive boardroom and a VIP suite, all with easy sound and lighting controls. There are spacious pre-event areas. Parking is ad- equate with two outside lots and a covered parking garage. Award-winning catering brings the highest quality and refreshing creativity to every food and beverage of- fering, from a simple coffee break or event concessions to a formal banquet. And its attentive staff anticipates your every need. The Ocean Center location is unbeatable. Located at the crossroads of Central Florida, U.S. Interstate 4 and 95 offer easy access. And, the area is served by the Daytona Beach International Airport, which is only minutes away. The Ocean Center Convention Center is also only 60 minutes from Orlando and St. Augustine and is the fifth largest convention center in the state of Florida. With year-round sunny skies and warm hospitality and service, the Ocean Center can become your preferred destination. Be unbeatable, book Daytona Beach for your next sporting event and remember when the event breaks the ocean awaits. n L The Ocean Center in Daytona Beach Florida is Unbeatable Tim Buckley, CEM Sports Sales and Event Manager Tim has over 15 years' experi- ence at The Ocean Center and has the pleasure of working with some of the most re- spected organizations in the sports industry such as the National Cheerleading Associ- ation, USA Gymnastics, American Athletic Union, and USA Volleyball to name a few. He is a Certified Meeting Planner and is a facilitator of great event experiences. Daytona Beach Ocean Center Complex tbuckley@oceancenter.com (386) 254-4500 or (800) 858-6444 www.oceancenter.com Quick Facts: • Over 200,000 square feet of space • 93,028-square-foot Exhibit Hall • 42,146-square-foot Arena • 14,000-square-foot Ballroom • 32 meeting rooms with over 32,000 square feet of space • Spacious pre-function areas • Award-winning catering and Executive Chef • Full on-site event staff • Surrounded by hotels, restaurants, shopping and entertainment • Across from the Atlantic Ocean and spectacular beaches • An abundance of beach activities • Year-round warm weather and over 300 days of sunshine! 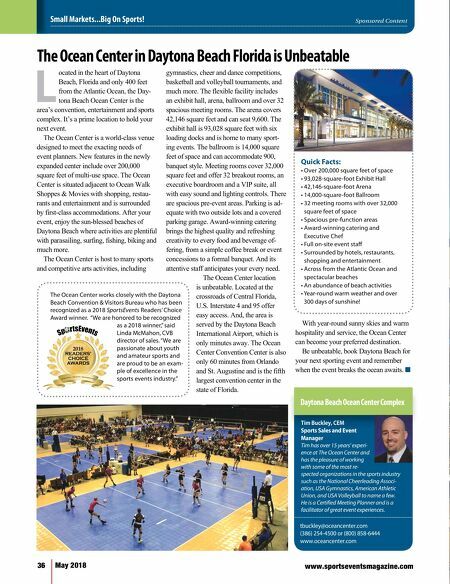 The Ocean Center works closely with the Daytona Beach Convention & Visitors Bureau who has been recognized as a 2018 SportsEvents Readers' Choice Award winner. "We are honored to be recognized as a 2018 winner," said Linda McMahon, CVB director of sales. "We are passionate about youth and amateur sports and are proud to be an exam- ple of excellence in the sports events industry."